The other night Pete came in cradling a closed, broken blossom from our peony bush. 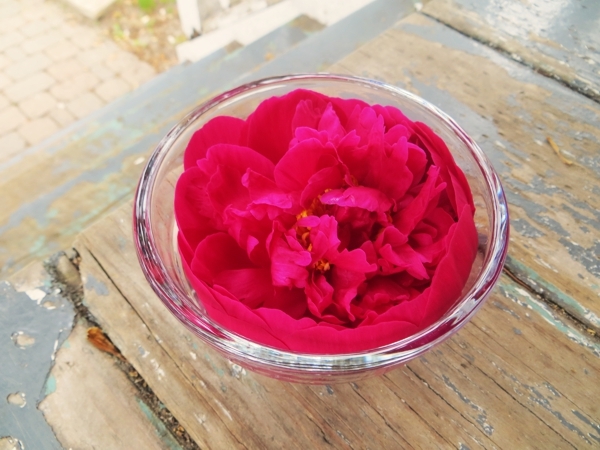 We were very sad about it because the bush is small and its flowers are few and anyway: peonies aren't out for long. It was disappointing. "Should I put in a bowl of water to see if it blooms?" he asked. "I guess," I said, not particularly hopeful. I picked up a prep bowl I hadn't put away yet, filled it from the tap, slipped the bud inside and set it on the windowsill to forget about. The next morning, it had bloomed. It's still a broken bud, but it's also still beautiful. Though it didn't feed its body or any insects, it reached another aspect of its potential - feeding joy - because Pete gave it extra attention by bringing it inside instead of leaving it on the ground, and suggesting a bowl of water which would never have occurred to me. Even though I've seen this happen more than a few times, it still surprises me how terrible things end up being okay if you put in the effort to make them so, or having some good points that wouldn't have happened without the terrible. In that scenario the good points never make up for the bad thing, but if the bad thing has to happen, it's important to acknowledge and value the good stuff that comes from it. In knitting or work or life generally, it's not so much about a silver lining - I always think of those as a good that far outweighs the bad, a theory that applies more to trivial disappointments - as it is about finding the good wherever it might be. And lately, even before the blooming peony, I've noticed some good in a few places where I didn't expect to. 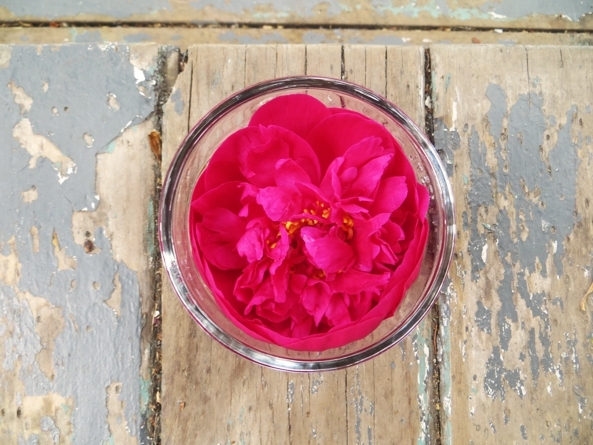 Maybe you've got some unnoticed good going on, too, and if so maybe our peony will help you see it more easily. Have a great day, and I'll see you tomorrow! That was really inspiring. I needed that right now. you have a beautiful way of looking at things. thank you. Peonies are one of my faves!